If you’re on the opposite of a gluten-free diet and interested in indulging in carb overload, book a flight to Japan ASAP – a company there has started selling individually packaged ramen sandwiches. Of course, for years we’ve been hearing about “ramen burgers” – hamburgers with a bun made out of ramen. But with these new ramen sandwiches from Japanese baked goods brand Yamazaki, the ramen isn’t the bread, it’s the middle. It’s part of Yamazaki’s line of “Lunch Pack” crustless sandwich pockets, according to RocketNews24. Typically, these little white bread pockets have something more common on the inside: peanut butter or tuna or whatever. But now, you can get one stuffed with Yokohama-style ramen: It’s literally noodles between two pieces of bread. Yes, these noodles are flavored in the Yokohama-style, a mix of pork stock and soy sauce broth, and some bits of pork are added to the mix. 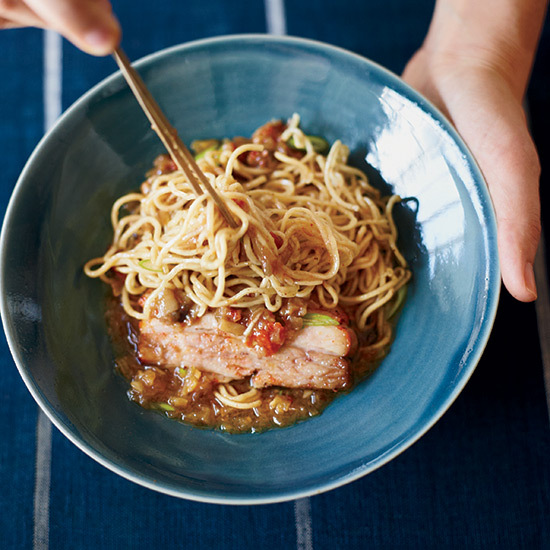 Still, we’re essentially talking about the Japanese equivalent of a spaghetti sandwich – which actually does not sound half bad depending on how deep your noodle love goes. RocketNews also points out that the strange sandwiches were made with the help of an extremely popular Yokohama ramen restaurant called Yoshimuraya, known for long lines. So though the idea of a ramen sandwich may sound a little crazy, maybe they’re not half bad. At the very least, they only cost about a $1.30 each. And if there’s one thing ramen has taught us, it’s that if you price it cheap enough, college kids will keep you in business.